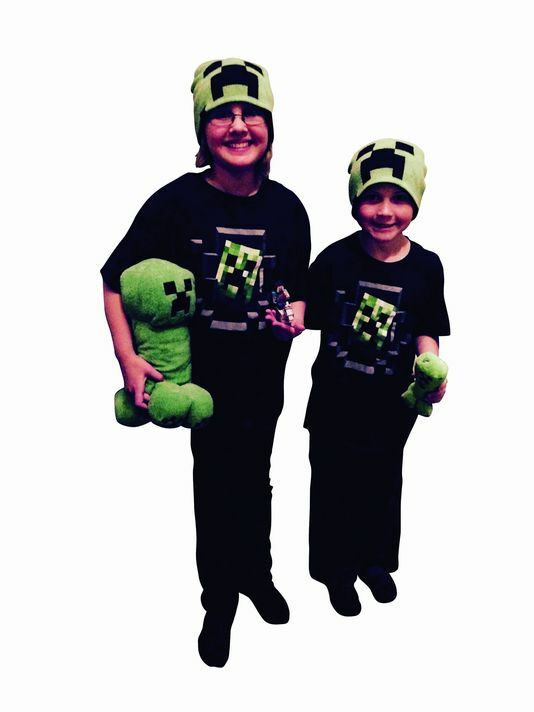 Ten-year-old Jillian and Colby Wagner love Minecraft and are dressed in their favorite Minecraft outfits. Minecraft is an online video game that allows players to construct three-dimensional virtual worlds out of textured cubes. As they build cities, they combat villains, like the Creeper, an exploding creature whose attack is dreaded by all Minecraft players. Although their parents, Brad and Jamie Wagner, have to limit the kids' screen time, they like that Minecraft isn't your typical video game. “Minecraft allows the kids to use their imagination with building, and it teaches them survival skills by having them create resources like farms and crops,” Jamie Wagner said. Jillian and Colby like it because they can play together; collaborating and helping each other build their virtual environments. “I love Minecraft. It's my favorite thing to play,” Jillian said. Jillian and Colby are both wearing Minecraft T-shirts and stocking caps depicting a Minecraft creeper. Both were Christmas gifts from their grandparents. Jillian collects microfigures, and she is holding the Minecraft character Steve on a horse. Colby collects Minecraft Legos and plush toys. “We wear our shirts to school a lot, but we can't wear the hat in school, just to school,” Colby said.